You are invited to attend our 2019 fall convention on October 11th - 13th in Bellview, WA. This year’s theme is Many Voices, One Community: Shaping the Future of Psychology Together. The three-day convention is the premier event for member and non-member psychologists and affiliated mental health professionals to earn up to 18 CE credits from high quality presentation and experience peer to peer networking that can never be matched online. This year’s host hotel is the Hilton Hotel in Bellevue, WA., conveniently located off of I-405, and approximately 18 miles from SeaTac airport. Attendees will enjoy free parking, a special convention Wifi connection and nearby eateries for lunch. A limited number of specially priced single and double guest rooms at low convention rates will also be available. The convention has many affordable opportunities for individuals, groups, vendors, and corporations to support our 2019 convention. There are seven sponsorship levels, display advertising in the convention program and Washington Psychologist Awards program, and a limited number of exhibitor spaces available. 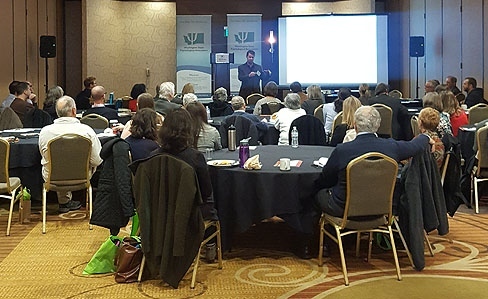 WSPA Fall Convention has become known for its high-quality in-person presentations. If you have a presentation to submit click here.